Click to download a camping supply list. Don't take the chance of leaving the important supplies that you need behind. There's nothing more frustrating than arriving at your campsite only to find that you've forgotten an important item that you really need in order to have the best possible trip. 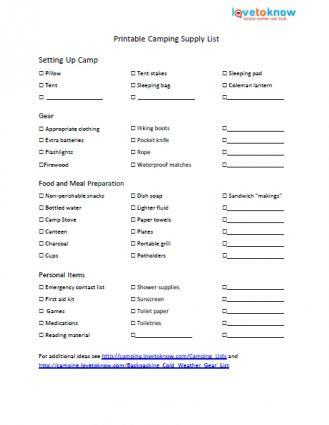 Download the attached printable supply checklist and use it as a starting point to prepare for your next camping trip. If you need help downloading the printable list, check out these helpful tips. Using the printable supply list provided here is simple. Just click the image to access a printable PDF file. Use the icons on the menu to print the list or save it to your hard drive or external storage device if you want to save it to print at a later time. Review the printed list, using the blank lines to write-in any camping items you may need that are not already included. Use your list as a guide while shopping for and gathering your gear, marking off each item that you need as you stow it in your gear bags or vehicle. Using this checklist will help make sure that you have everything you need for a great trip when you arrive at your campsite. You'll be able to relax and enjoy your outdoor adventure and not have to go without a necessary item or need to leave the campground to go shopping.